All three of my presentation here at ETC09 continue to hit on the point of creating a PLN you can trust and find ways to use. It’s so powerful…..but it’s hard to explain just how powerful of a learning tool it is without having people really get in there and get their hands dirty. So today I found a new use for my PLN. Every time I try something this like I’m amazed at the help and response I continue to receive from educators around the world who are willing to jump and help out at the drop of a hat. Although Borneo is amazing their Internet connection is…well…should we say inconsistent and slow. It’s up and down, completely unreliable, and frustrating to say the least. The one service that seems to run without fail is Twitter. I’m not sure if it’s the small packet size or what but Twitter continues to run while the rest of the web comes to a screeching halt (I never that we’d see that happen!). So this morning I’m preparing for my presentation and go to edit the wiki page I had created for my “Digital Tools for Digital Educators” session. The Internet was running really slow and with only two hours to go before my presentation I was getting worried that I wouldn’t have anything preloaded. 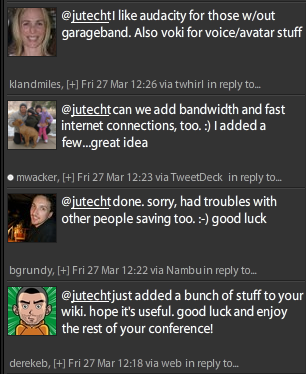 So I used the one tool that worked….Twitter. I sent out a call to anyone with a good Internet connection to please go and add a must have tool for educators. An hour later I have enough tools to fill my 90 minute session and then some. Complete with YouTube how-to videos, examples of use in the classroom, and much more. Now I’m part of this network, and I understand that this is exactly how it’s suppose to work, but it still amazes me! I started my presentation today in a room of 50+ educators by thanking educators around the world who two hours before had just created my presentation. I talked about how this came to be and just how amazing this was going to be that these 50 people were actually being taught by teachers around the world…..I just happened to be the voice for them all. It was great to see people coming up to a whiteboard that was in the room and writing down the names of those who have twitter accounts here at the conference as they start to build their own network. During one of my sessions yesterday I asked those on Twitter to please write their Twitter handles on the board to help others start their PLN. It was a great example of how a PLN can be used to created content through connections. In my first session I shared a quote with the group that came from a Vanity Fair article entitled: How the Web was Won. A fantastic look at the history of the Internet. How interesting that even before the web as we know it today was created that the founders of what would become The Web already knew that what these connections allowed were communities and in the long run it would be these communities that made The Web so powerful. I believe that’s what this little story of mine shows. Sure the content is there, but it’s the community that was the important part. And not just any community, but a community of people who live in a “nearly now” space. Which is the true power of Twitter. If I would have posted this on my blog it never would have happened. Without the community I would not have had the content. The connection with people lead to an amazing opportunity for people here on an island in the South Pacific to learn. An opportunity for them to learn from educators around the world. My job was simply to display and point people to the collective resources. Thank you to everyone who helped me out with this presentation. I hope someday I can return the favor. Thanks for making this experience transparent. One of the struggles that I have in convincing people that a personal learning network—-and Twitter as a tool—is worth creating is providing concrete examples of how it can make one’s work easier and more efficient. That’s what you’ve done here. Which brings me to a question about introducing teachers to digital tools: Do you think schools make a mistake when they try to push teachers to use tools in their teaching BEFORE encouraging teachers to use tools in their own learning? Would our efforts to see digital tools creep into classrooms be better served on finding ways to help teachers do common tasks quickly in the hopes that we’d “hook” skeptics and that they would move on naturally to find classroom applications for the tools that have served them well? I only ask because it seems like the majority of the conversations that are happening on the ground in schools are all centered on getting teachers to use tools in their teaching, yet despite years of pushing, there’s less change than you’d expect. Wow, thats a living breathing network in action. Great story. Initially I really thought twitter was just an adult MSN, but I have been proven wrong many times as great links, advice and tips are freely given by learners all around the world. Can’t do without my extra human filter now. I still lean slightly towards content first, as my PLN is not yet extensive, but the great people within it do add value to their content significantly. If I can contextulise the content with the person offering, it means far far more. Quality content in isolation is still excellent, but for me stronger connections are made if we can also share f2f or in some form of discussion or debate or other “value added” form. A bit like reading a fantastic “can’t put it down” novel in isolation or sharing the experiences later in a book club. Both are equally valid, just different. Bill your comments are exactly what we are trying to achieve with staff at our place. Create a strong connection in their own lives first (bring 10 sites you like to & add these feeds to their aggregators) Try NOT to mention ICT, technology or computers much at all, even though thats what we are doing. Talk about their interests first and many of their other frustrations or fears are diminished. Attitudes, not skills, are essential changes for them to see connections in their own lives first. Thats pretty much the way kids do it. Thanks also for some workshop ideas for our connected learning conference in July. What a fantastic example for your presentation audience to witness the true power of a PLN. 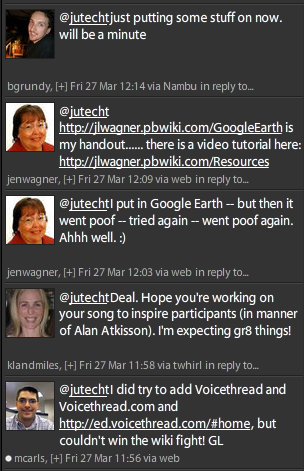 I find it difficult at times to explain Twitter (or something like it) to people who do not use such tools. Add that to all the bad press microblogging is getting lately about being self-indulgent, etc. — that just layers misconceptions upon misconceptions. To truly understand how amazing a PLN can be, you have to use the tools, contribute as much as you ‘take,’ and give it time to develop. You were one of the very first people in my PLN. In fact, I started following you on Twitter when I was sitting across from you in the Bloggers’ Cafe at NECC. I have learned so much from you and the rest of the amazing people in my PLN. It took me a couple of months, but I finally got the power of Twitter. Ever since then I have tried to show educators that there is value in social networking. I recently came up with a project to test the power of this network. Please check out the project on my blog. I think it is something you will find interesting. I would appreciate your help spreading the word about it.